Are you missing out on an auspicious, cost-effective form of marketing? Internet exposure gets more competitive every minute. With tons of businesses vying for potential clients, it’s a big challenge to draw your target market to your website. Yet, promotional products – yard signs, pens, flashlight key chains, tee shirts, caps, etc. – still provide a high yield for a minimal upfront expenditure. Let’s explore ideas to capitalize on putting promotional products to work for your business. The pen is mightier than the internet! Promotional pens top the list of most-loved promotional items. Due to their affordability, you’ll save advertising $$. Put this ‘found’ money into other marketing endeavors. People use pens every day. Pens have been around for-almost-ever. Pens with your pertinent business information get more mileage than internet sales pitches. To grow a customer base on the internet requires that people find you. However, handing out the humble pen is a form of subliminal advertising. Each time the receiver uses it, they are subtly reminded of your company. And, even if they leave it somewhere, a potential customer will likely find it. People collect them. Marvelous keepsake items from travels, etc. Magnets rock boring refrigerator doors. Practical uses galore. Display kid-art. These are a few reasons people crush on fridge magnets. Take advantage of colorful, custom printed fridge magnets. Your customers will place them front and center where it’s too tempting for others to resist reading them. Plus, people who work in offices stick vendor magnets on metal file cabinets for future reference. 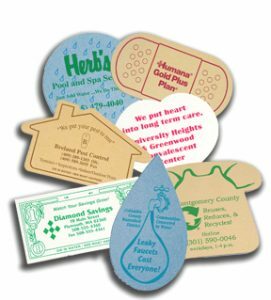 Refrigerator magnets are viable promotional products that work for your company in the coming years. Practically nobody throws them away. Unless…you include dated information…such as the current Little League calendar or upcoming sales. Promotional fridge magnets can do double duty as your business card. Include one in customer correspondence and imagine their smile upon opening. Bonus Tip: One-up your competition with a neon colored business card fridge magnet. Because it glows in the dark, the recipient is reminded of you each time they get out of bed for a drink of water. Statistics have it that the top five percent of your clients are responsible for one-third of your company’s total revenue. These customers are your cash cows and deserve special recognition from you. Inexpensive swag, like pens and fridge magnets aren’t the ideal way to show your love to a CEO who spends Big Bucks with your company. Yet, the right promotional gift will express your thoughtfulness and appreciation. Make it memorable. Explore the world of classy and unique desk accessories. Personalized executive candy dispensers, stocked with his/her favorite candies are a fantastic conversation piece. Here are ideas to kick-off your inspiration: leather messenger bags, portfolios or journals, imprinted with the recipient’s name, crystal desk clocks, wooden perpetual desktop calendars with name engraved on plate, etc. Bonus Tip: Once you get those important gifts, go make a huge impact. Don’t make the critical error of sticking them in the mail at Christmas or their birthdays. Find a sweet little café that serves awesome pie and coffee. Call and set up individual coffee dates with each superstar client. Say you want to celebrate a non-occasion day with them.